Having the right office supplies for your needs can really make a difference to your business. Office products can actually determine how your customers perceive the company, especially when it comes to presentation products like report covers. People often work days to fine tune that perfect presentation, but put little or no thought into the report cover that the presentation will be packaged in. Getting the right report covers for business today is like developing the right packaging for your product. People form a lasting impression about you and your company right from the beginning, so you want to make a good first impression. Using a report cover for your presentation that permeates quality and confidence immediately puts you on solid ground with potential clients. You take time to select the right suit and tie for that big meeting. Believe it or not, you should take at least some time to make sure the report cover you are using matches the environment. 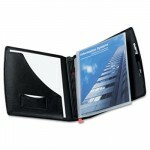 Executive grade laminated folders, heavy duty poly plastic, and leather-like grain cover stocks all exude confidence and prestige. For external meetings, always chose a report cover with a clear plastic front so you can feature your presentations cover page without having to open the cover. Clear window report covers, while not as popular, can do the same job while hiding part of cover page content for intrigue. Linen report covers are also folders that project a high quality prestigious image for important executive level meetings. When you need report covers simply to store materials, or for company meetings where the audience doesn’t really have to be impressed, then save money by buying standard grade report covers with just pockets. A frequent question is where to buy the right office supplies like report covers. I am adamant to never buy from the Mega-Depot corporate huge retail stores. I buy office supplies online to save time, and also save money. There are new independent office products companies today who have free shipping and low prices, that also really care about the community. One even donates 50% of their profits to great charities like Best Friends Animal Society. I say find this type company and support them. Zuma Office Supply supports Best Friends Animal Society and other great charities with 50% of our profits! Another question is when should you use a ring binder, like a 1 inch binder or 2 inch view binder rather than using a report cover. First, report covers, even if they are really premium grade, will usually be cheaper for you. Second, binders can be bulky and hard to file for you customer, plus they are really hard to lug around on presentations. Basically, if your presentation is under 50 sheets, a report cover is usually the best way to go — it’s both less expensive, and more functional for the user. When shopping for report covers, remember they come in 3 basic styles — prongs, just pockets, or pockets with prongs. The clear front report covers for presentations normally just have the three tangs so you can insert 3 hole punch paper. If you prefer report covers where you don’t need a 3 hole punch, try the Dura-Clip from Durable, Avery’s Flexi-View report covers, or the new line from Esselte called i-Organize which are really cool. Color selection is important in today’s fashion conscious world, and report covers are like any other office products category; there are many to chose from. No longer are the standard white, black, blue and red report covers your only options. Now, there is emerald green, blazing yellow and even teal report covers to match just about any color preference. First impressions are lasting impressions, so next time you have that big presentation coming up for your business, take the extra time to find a report cover that conveys the image and style you want to project. Packaging your ideas in the right report cover goes a long way to your small business success. This entry was posted in Cool & Interesting Stuff, Office Supplies Shopping Tips, Product Information and tagged Best Friends Animal Society, office products, office supplies, Report covers, view binders. Bookmark the permalink. I certainly learned about almost all of this, but never the less, I still believed it was practical. Beautiful task! Glad you enjoyed the post. We do our best to inform about cool office supplies, and maybe have some fun too! Glad you like the article. Office supplies can make a difference in people’s lives when you buy office products from Zuma. Zuma helps you do good work with quality supplies at low prices, and in turn we do good work for great charities through the profits generated. Enjoy today! Whoa, just what I was searching for. I appreciate your post.